^ 聖經《和合本修訂版》面世. 昔日東方. 2010-09-28 [2012-10-06]. 尤思德(Jost Oliver Zetzsche)：《一生之久的工作：〈和合本〉翻譯30載》(The Work of Lifetimes: Why the Union Version Took Nearly Three Decades to Complete)，載於 伊愛蓮(Irene Eber) 等 著，蔡錦圖 編譯的《聖經與近代中國》. 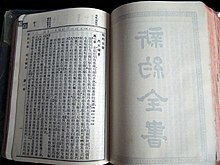 香港：漢語聖經協會，2003年：61-83頁. ISBN 962513350X. 伊愛蓮(Irene Eber)等 著，蔡錦圖 譯：《聖經與近代中國》. 香港：漢語聖經協會，2003年. ISBN 962513350X. 海恩波（Marshall Broomhall）著，蔡錦圖 譯：《道在神州—聖經在中國的翻譯與流傳》. ISBN 9789625131887. John R. Hykes: Translations of the Scriptures into the Languages of China and Her Dependencies, 1916.